"Yahoo! Web Hosting" Reviews (Apr 2019) - Why 4.8 Stars? Most known for personal email and a powerful search engine, Yahoo! offers an array of hosting, eCommerce, site builder, and business email plans. Easily promote your online presence with local marketing tools and track its growth via a mobile app. Yahoo! lends itself to the budget-minded business owner with feature-rich, cost-competitive offerings. “When you think Yahoo!, you probably hear the iconic "Yah-hoooOoo!" howl made famous by the online messenger in the 1990s. Since then, the online brand has broadened its horizons to full-fledged web hosting and email solutions for personal and business use. Having reviewed the shared hosting, website builder, and eCommerce solutions, the price point is certainly one of the most appealing features. From a price tag point of view, Yahoo! remains competitive with the industry's most popular and most affordable hosting providers. The company doesn't overwhelm users with a boatload of unlimited freebies, but you'll find everything you need to launch a new website — starting with a free domain and ending with $100 in paid marketing credits. The website builder comes equipped with thousands of ready-made themes, or templates designed to draw visitors into your conversion funnel. The designs are beautifully made, customizable, and mobile- and SEO-friendly. If you're building an online store, customers can pay via PayPal or credit card, and you can set up shipping options via USPS. Last, but most certainly not least, Yahoo! excels at business-grade email hosting. Get unlimited email storage for up to 1,000 accounts, and enjoy seamless account management from a single dashboard. Everything from your messages to your attachments, contacts, and calendars is secured via 2,048-bit encryption, and the Yahoo! team is on call whenever you need them. Get started on Yahoo! now. “If you're looking for a low-cost entry into web hosting, or for an ultra-affordable email hosting platform, Yahoo! should be on your short list of potential providers. The team has crafted solutions fit for any size business, so you only pay for what you really need out of a host. While Yahoo! is not one of the hosts that promises "unlimited everything" (often with strings attached), you'll get everything you need at a competitive price. Annual plans include a free personalized domain name registration, and it's yours to keep as long as your Yahoo! account is active. The storage allowances are relatively low compared with those of competitors, but the disk space will certainly cover basic websites. You also benefit from a free website builder and its associated themes, all of which are customizable and mobile-friendly. Yahoo! shows its true value in its email hosting offering: business-class email hosting that's 100% secure and scalable to meet the needs of SMBs, enterprise, and beyond. The cost can't be beat, and the easy management is highly appealing to the busy professional. Alexandra Leslie (HostingAdvice.com): This rating is not available yet. We haven't evaluated Yahoo! Web Hosting for the "Dedicated" option yet as they do not currently offer this type of hosting service. We're always working to keep our reviews up-to-date so check back later! Does Yahoo! Web Hosting already offer the "Dedicated" option? Let us know. Alexandra Leslie (HostingAdvice.com): This rating is not available yet. We haven't evaluated Yahoo! Web Hosting for the "VPS" option yet as they do not currently offer this type of hosting service. We're always working to keep our reviews up-to-date so check back later! Does Yahoo! Web Hosting already offer the "VPS" option? Let us know. Alexandra Leslie (HostingAdvice.com): This rating is not available yet. We haven't evaluated Yahoo! Web Hosting for the "WordPress" option yet as they do not currently offer this type of hosting service. We're always working to keep our reviews up-to-date so check back later! Does Yahoo! Web Hosting already offer the "WordPress" option? Let us know. “All Yahoo! web hosting plans include a free drag-and-drop website builder and hundreds of customizable site templates. Whether you're building a personal blog or a professional eCommerce site, you can easily find a design to match your vision for your online presence. 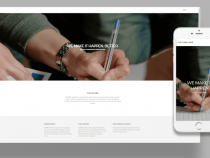 The website builder themes — particularly those for eCommerce — are optimized to convert, SEO-friendly, and mobile-responsive. Your site or storefront will be easily accessed on any device, and $100 in free advertising credits will help ensure your brand is picked up by online search engines. By selecting an annual plan, users get a free domain name, and you can set up business email at that domain, too. Once your site is customized and promoted, track its progress and analytics via the Live Insights mobile app for iPhone. Yahoo! website building is designed to be simple and stress-free — and that begins with the low, low pricing. HostingAdvice users get 80% off the first month! Yahoo! provides low-barrier entry into web hosting with all the essentials: a free domain, up to unlimited disk space and data transfer, and unlimited email storage for up to 1,000 email addresses or accounts. Build 10 webpages, or build as many as your heart desires! Yahoo! plans are flexible, and it's easy to determine which package will best suit your business needs. Your site will be online and available 99.9% of the time with backups stored in strategically placed locations to keep your site data secure. Widely known for hosting personal email accounts around the world, Yahoo! supports email hosting needs for businesses ranging from startups and SMBs to established enterprises. The stress-free management console is ideal for business use, including calendars, document management, email aliases, and contact displays. 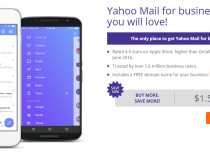 Keep all your email accounts — from Yahoo! personal, Yahoo! business, Gmail, and Outlook — in one place. Your email is secured with 100% encryption by default, and this covers your messages, attachments, calendars, and contacts. The Yahoo! 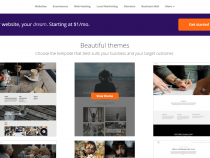 website builder comes with tons of beautifully designed templates. Choose the one that best matches your brand identity, voice, and aesthetic requirements. The design interface is intuitive, and your finished site will be 100% mobile-friendly. If you're building an online store, choose from one of many conversion-driven eCommerce themes. All templates are SEO-friendly, making it easier for customers to find you, and you can accept payments via all major credit cards. Once you've customized your online presence to your liking, it's time to advertise and get the word out about your new website! Yahoo! helps you launch your marketing efforts with $100 in free advertising credits. Localworks, a local marketing service, will ensure your business is found in more than 60 local directories, including Google, Yelp, Bing!, MapQuest, and, of course, Yahoo! Track your site's progress straight from your iPhone using the Live Insights apps. Yahoo! welcomes first-time site owners with an intuitive management console, easy-to-use email tools, and WYSIWYG (what you see is what you get) website builder options. The customization and virtually nonexistent learning curve make Yahoo! hosting solutions ideal for first-timers. The low pricing is probably what will first catch your eye when reviewing Yahoo! 's hosting services. The company offers ultra-affordable solutions for web hosting, business email, marketing, and website building. Unfortunately, the eCommerce offering isn't ideal for the budget-conscious small business owner, but the tools themselves are not too shabby. Yahoo! provides a few of the staple reliability factors we look for in the top hosts. The 99.9% uptime guarantee is pretty much an industry-wide standard, and the company offers a 30-day satisfaction guarantee for all web hosting plans. The main support feature(s) missing is/are around-the-clock network monitoring or other peace-of-mind services such as automatic backups and restore functionality. The team is available 24/7, however, to address any support issues that may come up. Yahoo! brings a competitive, flexible offering to the table, providing low-barrier entry to web and email hosting for small business owners. The well-known online brand offers everything you need to establish a lasting web presence, starting with a mobile-friendly website builder and eCommerce platform and ending with local advertising and online search optimization. Unfortunately, the tools for creating online storefronts aren't as cost-effective as those of other hosts we've covered, but the email and basic site-building solutions are a great value.